Bloomberg’s story about an alleged hardware implant installed on motherboards hasn’t gone unnoticed. In the following days, many people gave their insight about the feasibility of such implants (regarding its size, its capabilities or simply, the way to detect it). As said here, there are ways to interact with the network card directly from the hardware. Several people were pointing out the fact that the BMC (Baseboard Management Controller – the component allowing an out-of-band access to the server) could be tampered with, allowing an implant to control the BMC to gain access to the network card. But how does it work in practice? Let’s see if we can reproduce this. Let’s start by looking at possible interfaces between a NIC and a BMC. One of the main protocols to use an out-of-band management is IPMI. As Wikipedia tells us, “The Intelligent Platform Management Interface (IPMI) is a set of computer interface specifications for an autonomous computer subsystem that provides management and monitoring capabilities independently of the host system’s CPU, firmware (BIOS or UEFI) and operating system.”, which looks a lot like what we want to achieve. 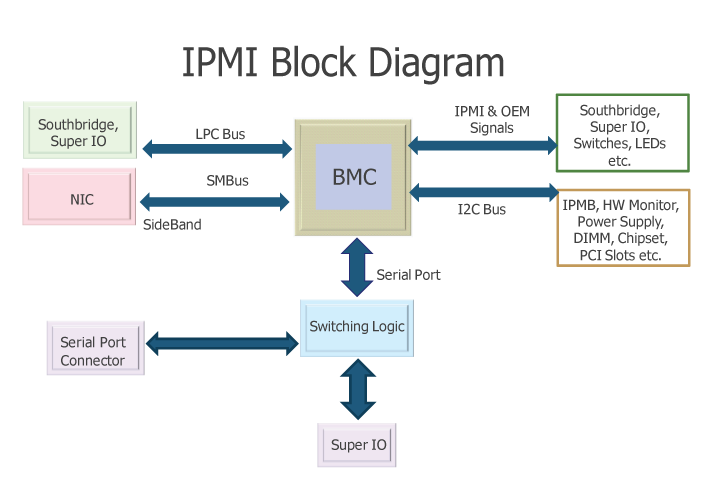 Actually, IPMI defines two Sideband channels to the NIC: SMBus and NC-SI. NC-SI is a modern replacement for SMBus, allowing a faster transfer rate and other new features. The problem is that it requires more signals (around 10), which is much more difficult to interfere within the case of a hardware implant. For now, let’s stick with SMBus. The System Management Bus (SMBus) is, according to Wikipedia “a single-ended simple two-wire bus for the purpose of lightweight communication. Most commonly it is found in computer motherboards for communication with the power source for ON/OFF instructions.”. It is derived from the I²C protocol, which is commonly found on a lot of microcontrollers. This interface requires only two signals (Clock and Data) and a third one for asynchronous alerts. This looks like the perfect protocol to play with for our implant. Not having access to a motherboard with a BMC, we have to be creative. Looking at server motherboard datasheets, we found that several of them use the Intel 82574L chip. This chip, according to the datasheet allows “SMBus advanced pass-through interface”, which looks exactly like what we need. The best part is, it is available as PCI-E cards. A detour to a store later, we now have some Intel EXPI9301CTBLK cards with the 82574L chip. Now what? Back to the datasheet, we can locate and trace the SMB_DAT, SMB_ALRT_N, and across the PCB. Fortunately for us, they were available on headers. Sounds really easy, isn’t it? The NIC PCB. The EEPROM is in the top left, the SMBus connector on the top right[ALRT|CLK|DAT]. Notice that R39 and R40 are unsoldered, disabling SMBus access from the PCIe connector. We connected an I²C probe and scanned the SMBus, but nothing useful could be read. Reading the datasheet shows that the SMBus is enabled only if a specific register bit is set. That value is loaded from the onboard EEPROM. Time to dig deeper. Found Winbond flash chip "W25X40" (512 kB, SPI) on buspirate_spi. Be careful that the words in the EEPROM are stored in little endian format, so the values have to be changed accordingly. < 00000010: 69e4 0881 6b02 1fa0 8680 d310 ffff 5a9c i...k.........Z. > 00000010: 69e4 0881 6b02 1fa0 8680 d310 ffff 5adc i...k.........Z. The Hyrabus used as the implant, connected to the NIC. As you might imagine, we continued reading the datasheet and sent crafted commands to the NIC to verify that everything is working as expected. [START] and [STOP] being the START and STOP conditions defined by the I²C protocol. And yes, this is our MAC address! Now that we know how to talk to our NIC, let’s see how we can actually use this channel to steal network traffic and send some. Again, chapter 8 of the datasheet explains everything we need in order to do what we want. This is described in chapters 8.6 and 8.8.1. There we can simply generate an Ethernet frame using commands. print "Could not get into binary mode"
print "Cannot set I2C mode"
Attacker machine tcpdump on the top left. The implanted machine is on the top right. We can create a covert channel that will not be seen by the implanted host. It was quite difficult to set up everything correctly, and we tried a lot of different combinations in order for the filtering to work. Fortunately, an application note from Intel gives us more details on how to initiate the filters the way we need it. As defined on datasheet chapter 8.8.1.3, the receive enable command needs to set some bits in order to enable the receiving, and the method used to send frames back to our implant. We chose the SMBus alert since the other modes allow the NIC to perform asynchronous requests on the SMBus (See chapter 8.4.5 for details). Because we used the SMBus alert method, we need to wait for the SMB_ALRT_N signal to go off before sending the Receive TCO Packet command. If we wait for too long, the packet will be discarded from the NIC. On the left, we can see the SMBus command to read a frame, with the data contained in the frame below. On the right, the tcpdump running on the implanted host does not show any incoming frame. Top: Captured SNMP query from the implant. Bottom: The SNMP query made to the implanted host. In this post, we described a possible way for a small and inexpensive microcontroller to be used as an implant at the NIC level. That kind of implant needs at least four pins (Vcc, GND, CLK, DAT) to be useful, and allows to take control of the host NIC. Sniffing received network traffic coming from the host. Receiving commands from the network, without the host knowing it. Transmitting data to the network, without the host noticing it. This example used an Hydrabus as the interface for the I²C/SMBus, for the sake of simplicity but implementing the same on a small microcontroller like an ATtiny85 (pretty much the size of the NIC’s EEPROM) would be just as easy. However, on a real case scenario, such an implant would only have access to the SMBus. Depending on the motherboard design, this could be the only accessible device, so no interaction with the host operating system is possible. In the case where a full operating system compromise is a requirement, modifying the BMC code would be the best option since it already has access to all the interesting buses and does not leave any visible footprint on the motherboard. One other drawback of such implant is that it is only able to get data at around 100Kb/sec which is not enough to perform a full traffic inspection. On top of that, only traffic coming from the network can be captured by the implant. This makes this solution somewhat inefficient when compared to the efforts needed to implement it into a target’s hardware.